1. Place a lettuce leaf on each slice of sourdough. 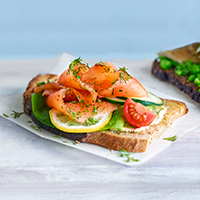 Drape over the cured salmon, then top each with a quartered cherry tomato, 2 slices of cucumber and a slice of lemon. Drizzle over the mustard dressing from the packet and garnish with chopped dill, if liked.